Kiln drying is a standard practice in wood production mills and serves to efficiently bring green lumber moisture levels down to “workable” range–moisture content levels that will not end in the myriad of problems that can be caused by excess moisture levels in wood. These problems include warping and twisting in dimensional lumber, binding or kicking during machining, buckling or crowning in an installed wood floor, and adhesive failures in finished products. Moisture-related problems can cost millions of dollars in damages each year. Kiln drying is a first step in bringing all wood products to moisture content (MC) levels that will be subject to minimal moisture-related damage. 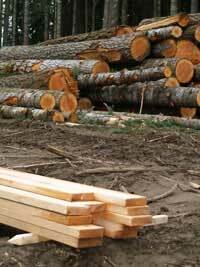 When trees are felled and brought to a lumber mill, the first step is usually to debark and sort the logs by species, size or by end use. Logs destined for wood flooring, for example, are then sawn into rough boards of the required dimensions. These are often edged or trimmed for length before they are dried. Drying can be done either by air or by kilns, which use circulating heated air to more rapidly remove the excess moisture from the wood. Each charge (or kiln load) is sorted by species and dimensions to optimize the process and to ensure that the final moisture content levels are even across the charge. After the wood has reached the correct moisture level for that species, it is sent through the planer and planed to its final dimensions, sorted to grade and shipped out. For wood flooring or other specific end products, the wood is typically shipped to a manufacturer for further planing, processing, and finishing. Mills and manufacturers alike invest time, money and training into their drying processes to provide optimal grade products at the correct moisture levels for their customers. So if the wood leaves the kiln at the required moisture content level, the moisture content process is complete, right? It might seem feasible, but in reality, kiln drying is only the first step of a wood product’s life-long interaction with moisture. Kiln drying significantly reduces the moisture content of green lumber, but there’s more to be considered. The reality of wood’s nature, and indeed, part of its attraction over the centuries, is that it is a hygroscopic material. Until it is fully sealed, wood constantly interacts with moisture in its environment and will absorb or release moisture as necessary to find a balance with its environment. Examined closely, wood’s long, hollow cell structure means that each board is composed of bundles of long cells (think of a stack of drinking straws). In a living tree, those pathways function to move moisture and nutrients from the roots to the branches and leaves of the tree. Once the tree is felled, those pathways begin to lose that moisture as the wood dries. That moisture is naturally not replaced as it would be in a living tree, and the wood’s moisture level will drop considerably as it dries. The kiln drying process helps to draw that moisture out while minimizing the damage to the wood that rapid changes might cause. “Wet” or green wood does not function well for anything from campfires to building materials. Its performance as green lumber can be unpredictable because of that inevitable moisture loss after the living tree is felled. As it dries, wood can twist, crack, warp, and shrink in its physical dimensions, making it less than ideal for buildings, flooring or woodworking. It’s an ongoing cycle in wood. Think of a sponge. When a sponge is wet, it holds moisture in each hole or cell. As it dries, it not only releases that moisture, it shrinks in size. If it has been trimmed to a functional shape, like a rectangle, it may twist or curl as it dries. It does not, though, lose its capacity to reabsorb water when it is present. The sponge’s physical dimensions will change each time it absorbs and releases moisture. In the same way, wood may have much of its moisture removed during the kiln drying process, but it does not lose the ability to reabsorb moisture that is in its environment. It might be a direct water source, moisture in an adjacent material or even humidity in the air; wood’s cellular structure will be ready to absorb any moisture it contacts. Even when wood has been kiln-dried, it may have a documented moisture content level, but at any step of the process after the kiln–transportation, manufacturing, storage or installation–it is possible for wood, even manufactured wood products, to lose additional moisture (in a dry environment) or re-absorb ambient moisture, altering its moisture content level and possibly even its dimensions. If that moisture increase or decrease happens, for example after a wood floor has been installed, buckling, crowning, gaps, or other moisture-related problems can jeopardize the floor’s integrity. Any completed wood project or product can be jeopardized by moisture imbalances in the wood used. Just as lumber mills and manufacturers invest in accurate wood moisture content management tools and systems, each step of a wood product’s lifespan requires moisture content measurement. Continuing with our wood flooring example, it is just as important that the flooring installer allows each board bundle to acclimate to the job site environment before installation begins as it is for the manufacturer to make sure the moisture content is accurately monitored before it leaves the plant. An accurate wood moisture meter can provide quick, accurate and reliable monitoring of wood flooring to ensure that the installed floor will not suffer from moisture-related problems like those identified above. Wagner Meters’ non-damaging line of pinless wood moisture meters can take measurements as frequently as necessary without marking the floorboards or causing imperfections that will become visible once the finish is applied. With accurate and current wood moisture content measurement, the flooring can be installed with assurance and finished for long-lasting and durable use. From forest to final finish, wood’s relationship with moisture must be understood and accurately measured, not just in the kiln but at each step of the way to its final use.